Carrick’s Glenn Irwin is refusing to allow his head to drop after being ruled out of this weekend’s fifth round of the MCE British Superbike Championship at Snetterton. The PBM Be Wiser Ducati rider also missed the last round of the series at Knockhill in Scotland, where a crash in practice left him with a dislocated left elbow and shoulder. It came at a time when Irwin was on a high after clinching his best ever BSB result of second place in race two at Oulton Park behind team-mate Shane Byrne, before the 27-year-old then lit up the North West 200 with a stunning victory in the feature Superbike race. However, an optimist by nature, Irwin is still his same bubbly self despite his injury setback and he has targeted round six for his comeback at Brands Hatch from July 21-23, even though the Kent meeting comes a few weeks before the end of his expected eight to 12 week recovery period. Irwin told the News Letter: “It’s 13 days post-injury and I had three fractures, two dislocations and some nerve damage, but it really is coming on. I can lift my left arm out a bit and bend my elbow a bit, but I can’t straighten my arm; it’s coming though. “You can say I was on a crest of a wave but if the crash had been down to my own error or mistake and been a confidence-damaging crash, then maybe we wouldn’t still be on top of that wave, but I’m so optimistic and I’m still on that wave as far as I’m concerned! “The handlebar snapped on the bike and that’s what caused the crash – plain and simple,” revealed Irwin. “It is something that has happened to riders before, but it is quite unusual. 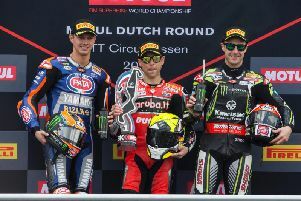 It’s just one of those things that can happen in racing and we saw it with Jonathan Rea at Donington Park, when he came off through no fault of his own due to a rear tyre problem and then also it happened with Michael van der Mark as well at Misano. Mulling over his prospects of a return at Brands, Irwin says he is doing everything possible to speed up the recovery process as he sets his sights on a comeback at round six in three weeks’ time. “Brands is the definite return date as such but that would still be weeks ahead of what I’ve been told is an eight to 12 week recovery period,” he said. “I do have a test planned at Cadwell a couple of days before Brands, which will be two weeks from this Tuesday, so really I’ve only got another two and half weeks. “I still can’t tense my triceps or bicep and I can’t lift my arm over my head and as much as we’ve made good progress, the next bit will be the hard bit. Irwin is in his second season in Paul Bird’s factory supported Ducati team and began the season in style with a third place at Donington Park before returning to the rostrum again at Oulton. Before his crash at Knockhill, he was fifth in the standings, only three points behind Christian Iddon in third, but has now dropped down the order to ninth.